Having done a lot of work over the past six months or so analysing sales in the newspaper market, I picked up Flat Earth News on the strength of a few Amazon reviews. 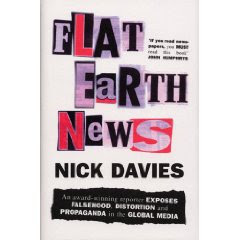 'Flat Earth News' is Davies' term for stories that are widespread and receive such substantial news coverage that their central theme becomes established fact, despite being fundamentally untrue. Think Iraqi WMDs or the Millennium Bug being set to wreak havoc. Davies explains the background to these - and other - examples, tracing where the stories came from and why they can spread like wildfire through the UK and global media without ever being seriously questioned. Despite the sensationalist description that you can see on the book cover, conspiracy theories about global news agendas, run by powerful individuals, are quickly rejected in favour of a much more interesting argument about what happens when you try to create large volumes of content at high speed and low cost. Like many books in the 'Popular Factual' category, this one falls slightly flat towards the middle (think Malcolm Gladwell) as the quantity of information required to flesh out Davies' central theme is probably a little less than that required for an acceptably large book. Although understandably using unnamed sources at times, having instilled a healthy distrust of the written word, Davies' arguments do suffer somewhat at this point. The book finishes with a bang, using real examples from named newspapers and illustrating some truly shocking examples of journalistic practice. Davies' isn't relentlessly negative - pointing to some stunning examples of investigative journalism - but overall paints a clear picture of a product declining in quality and perhaps hints at some of the reasons for falling newspaper circulations. Even (or especially) if you feel that you are already aware of recycled PR pieces and factually incorrect information in the UK media, try the book. Its original research certainly surprised me with the scale of these issues. All in all, a fabulous read that will change the way in which you perceive reported news; printed, televised and web-based.